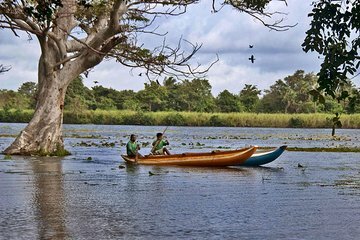 Experience the laid-back rhythms small village life in Sri Lanka during this private 5-hour day trip to the hamlet of Hiriwadunna. Observe wildlife like crocodiles, butterflies and birds at the local reservoir as local villagers fish and wash their laundry. Then take a boat ride to the other side of the lake, enjoying a ‘bullock’ cart ride and an included Sri Lankan lunch. Continue your small village excursion by crossing the lake by boat, after which you’ll enjoy a ride aboard a traditional “bullock cart” through the area’s rice paddies and vegetable plantations. You’ll eventually reach a village house where you can partake in a traditional Sri Lankan-style lunch. After your meal, you’ll be transferred back to your hotel in either Dambulla or Sigiriya.